Hades etage, 1-room terraced house 36 m2 on 1st floor. Simple furnishings: living/sleeping room with 1 double wall-trunk bed, dining table, international TV channels, hi-fi system, DVD and DVD collection available. Open kitchen (4 hot plates, microwave, electric coffee machine). Bath/WC. Electric heating. Terrace furniture. View of the countryside. Facilities: Internet (WiFi, extra). Please note: non-smoking house. 2 pets/ dogs allowed. 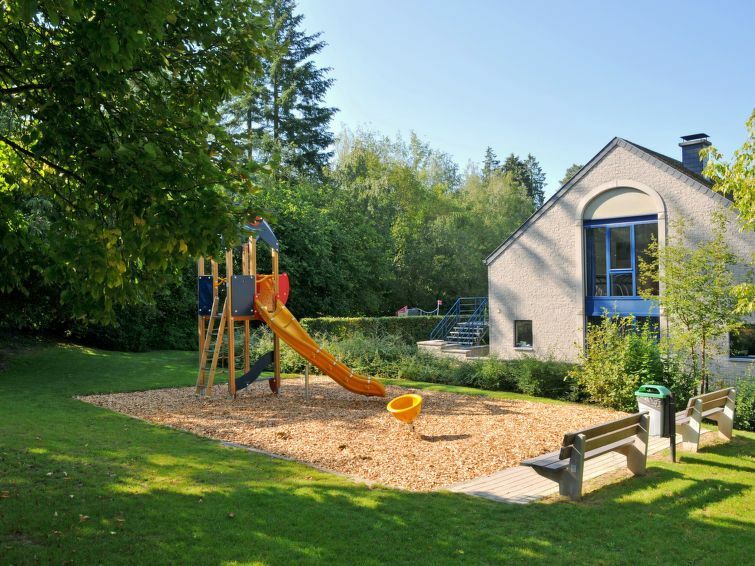 3 km from Durbuy: Child friendly, comfortable holiday development Résidence Durbuy, surrounded by trees, meadows and fields. In a quiet position on top of a hill, 2 km from the river, in the countryside. For shared use: large garden, swimming pool heated (01.06.-31.08.). Tennis, table tennis, boccia, children's playground. In the complex: reception, laundry (extra). (extra). Bread roll service. Central parking spaces. Shop 3 km, supermarket 5 km, restaurant 4 km, bar 3 km, bakery 3 km, café 3 km, bicycle rental 4 km, railway station Barvaux 4 km, indoor swimming pool 500 m, thermal baths Les Sanglier des Ardennes 3 km. Golf course (18 hole) 8 km, minigolf 4 km, riding stable 7 km, walking paths from the house 250 m. Nearby attractions: Megalietensite Wéris 10 km, Grotten van Hotton 14 km, Natuurpark Chlorophylle 27 km, Safari Park Le Monde Sauvage 32 km, Domein van de Grotten van Han 40 km, Plopsa Coo 42 km. Well-known ski regions can easily be reached: Baraque de Fraiture 30 km. Hiking paths: Bohon - Durbuy - Bohon 6.5 km, Bohon - Barvaux- Bohon 8.5 km. Please note: baby equipment on request (extra). Groups of teenagers on request only. Fishing [permit required]. The photograph shows a typical example. There are more similar properties for rent in this same residence. Reservations for workers on request.